Tarocchi Lombardi - thanoscardgamess jimdo page! 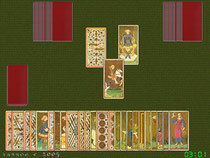 This is a suite of two Tarot games as played in Lombardy and Piemonte, Italy. The game is played by 3 players. The first dealer is chosen at random and the turn to deal passes to the right after each hand. Each player receives 25 cards in packets of 5. The dealer receives additionally 3 cards (for a total of 28) and then discards 3. Each player plays for herself.The Fool does not take and cannot be taken. The player shows this card to others and puts it in his taken tricks.It is possible to play the fool only if the player who put it down, won already minimum one trick before. Otherwise, if the player doesn't win trick in the entire game, the fool is taken by the winner of the last trick.